As a therapist and counselor I am constantly discussing with my clients ways that they can get closer to achieving happiness in their lives. In my last blog post I discussed three things that can get in the way of happiness, click here to read it. That post discussed negativity, greed, and jealousy. 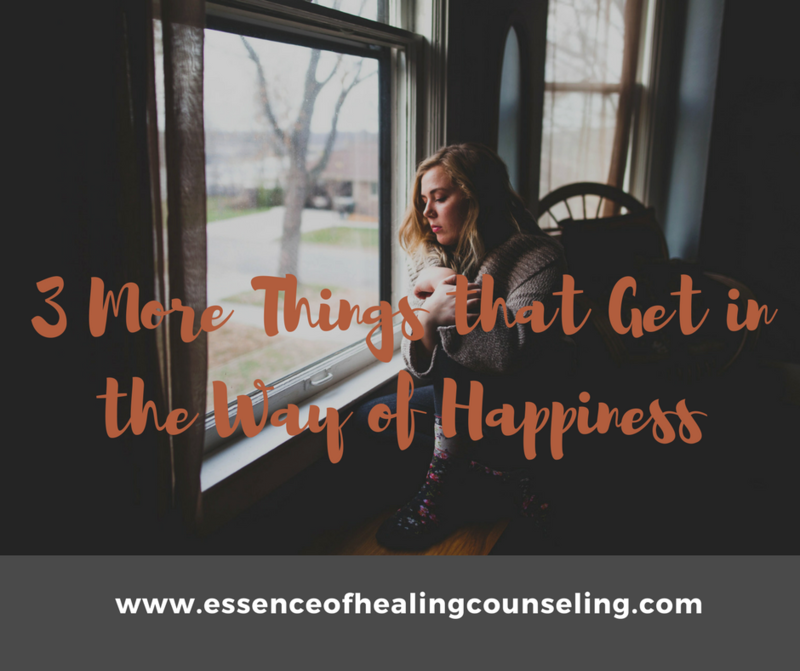 In this post I will discuss three more things that can get in the way of you being happy. Pride gets in the way of happiness because it is often rooted in stubbornness. People with a false sense of pride tend to stick to their beliefs and their actions even if they know deep down they are wrong. Proud people tend to fight change and be inflexible. People who have a false sense of pride usually have a difficult time handling criticism and have a low self esteem. Being proud stops you from being able to adapt and be flexible. Being able to adapt and evolve in life is key to being happy. You need to be able to shift and make changes when life throws curve balls your way. Take a look within and measure your own sense of pride and check whether it is getting in the way of you being happy. Anger is a natural emotion that everyone feels and is a natural response to have when we are hurt or disappointed. It becomes a problem when it is constant and gets in the way of your relationships and being happy. People who have issues with anger tend to hold on to resentment and focus on the negative. They also tend to blame others and outside factors for things that go wrong in their lives instead of taking responsibility themselves. People who have anger issues also are more likely to experience anxiety and depression. Holding on to anger is unhealthy and learning to release hurt, pain, and disappointment will open up the opportunity for happiness to come in. Guilt is having a bad feeling for doing something that you perceived to be wrong. Guilt can also come from feeling that we did not do enough of something or that we did nothing when we should have taken action. Guilt causes a terrible internal struggle and keeps us from feeling at peace. Experiencing guilt on a consistent basis for a prolonged period of time can lead to anxiety or depression. Happiness becomes too difficult to achieve if guilt takes up space in our lives. One of the best ways to fight guilt and get rid of it is to face its root cause. If you are feeling guilty because you hurt someone, garner the courage to face them and sincerely apologize. If you are feeling guilty because you feel that you haven’t done enough then motivate yourself and give a 100%. Instead of avoiding reality and letting guilt fester, stand tall and address your transgressions. Take the time to do an internal search and see whether you are engaging in any of the 5 things that get in the way of happiness. Once you face each factor and eliminate it from your life you will open up the chance for happiness to come flooding into your life.